Life is made less affordable for owners and renters by provincial encroachment into the municipal tax base. The province recently introduced their budget, the first, full-year budget for the new NDP government. They claim it “puts people first, makes life more affordable for British Columbians.” Although there are many aspects to the budget that are a welcome shift from the previous administration, the proposed provincial infringement into the municipal property-tax base is particularly problematic. There are a number of valid measures to curb foreign speculation and capital used to purchase real estate where provincial income taxes aren’t being paid. These concerns are now addressed in this budget through new and expanded taxes and enforcement that are long overdue. The devil is in the details of how this will be implemented, but not the focus here. It’s the provincial increase in the school portion of the municipal property tax that works against the objective to make life more affordable for British Columbians. The main problem with property taxes is that they’re not related to a citizens’ ability to pay, such as a person who bought their home a long time ago and is on a fixed or low income. The surtax is posed as a luxury tax, but the reality is that it includes many older character houses that are certainly not luxury properties, nor are most owners with million-dollar incomes. New houses may have owners who are more likely to have a larger income to support more taxes, but that doesn’t justify the province to encroach on the municipal tax base. Under the new measures, properties valued at higher than $3 million will be subject to an additional 0.2-per-cent tax on the value between $3 million and $4 million (plus $2,000), and 0.4-per-cent tax on the assessed value over $4 million (plus $4,000 per million), beginning next year. These are no small numbers and add up quickly. This annual increase is on top of the tens of thousands of dollars that many currently pay in property taxes every year and, for a principal residence, are based on after-income-tax dollars. The increase is only the tip of the iceberg if the province gets away with this precedence of infringement into the municipal tax base meant for civic services. Currently, the provincial school tax has crept up to about 35 per cent of the property-tax bill, plus about eight per cent for TransLink. With the new added surtax, the provincial take is in some cases to triple or more, and isn’t based on a mill rate, but directly on assessed values, a first of its kind. Citizens and municipalities should be very concerned. Property taxes are the primary tax base for municipalities to pay for civic services, with the province continually pushing to infringe on that tax base. The previous B.C. Liberalgovernment was pushing to use property taxes and development fees to pay for the provincial responsibility of transit, which the Mayors Council has been resisting. Now the NDP government is going after property taxes through a huge increase to the school tax. Schools are a provincial funding responsibility, mostly through provincial general revenue. 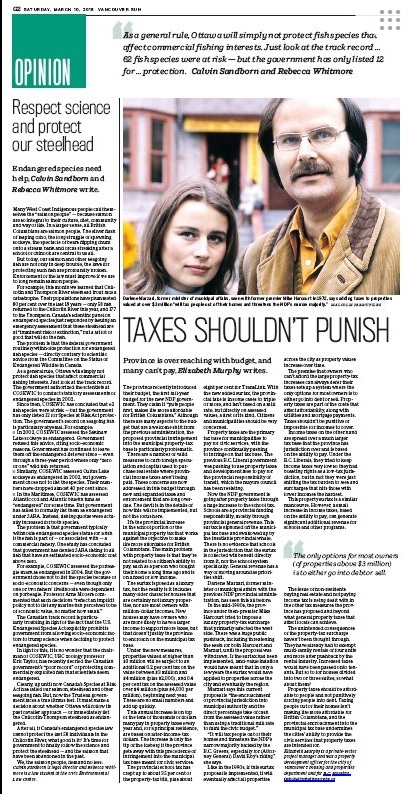 This surtax is siphoned off the municipal tax base and swallowed up by the insatiable provincial whale. There is no evidence that schools in the jurisdiction that the surtax is collected will benefit directly from it, nor the school system specifically. General revenue has a way of moving around as priorities shift. Darlene Marzari, former minister of municipal affairs with the previous NDP provincial administration, has seen this all before. 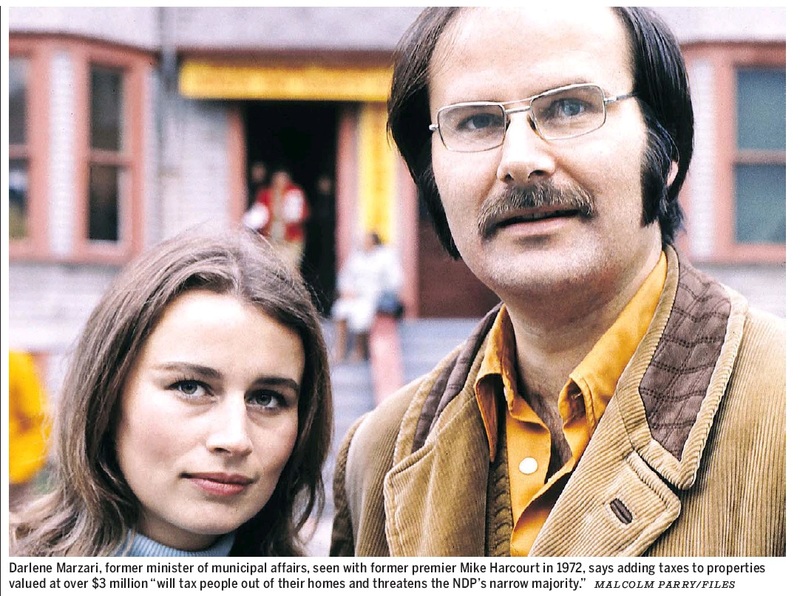 In the mid-1990s, the province under then-Premier Mike Harcourt tried to impose a “luxury” property-tax surcharge that primarily affected the west side. There was a huge public pushback, including threatening the seats for both Harcourt and Marzari, until the proposal was withdrawn. If the surtax had been implemented, land-value inflation would have meant that in only a few years the surtax would have applied to properties across the city and eventually the region. Like in the 1990s, if this surtax proposal is implemented, it will eventually affect all properties across the city as property values increase over time. The premise that if an owner can’t afford the large property-tax increases they can always defer their taxes, is setting up a system where the only options for most owners is to either go into debt or sell. Property taxes are part of the costs that affect affordability, along with utilities and mortgage payments. Taxes shouldn’t be punitive or impossible for incomes to cover. Income taxes on the other hand are spread over a much larger tax base that the province has jurisdiction over and is based on the ability to pay. Under the B.C. Liberals, they tried to keep income taxes very low so they had boasting rights as a low-tax jurisdiction, but in fact they were just shifting the tax burden to fees and surcharges that hits those with lower incomes the hardest. This property surtax is a similar maneuvre. However, a small increase in income taxes, based on the ability to pay, can generate significant additional revenue for schools and other programs. The issue of non-residents buying real estate and not paying income tax is being dealt with in the other tax measures the province has proposed and beyond what general property taxes that affect locals can achieve. 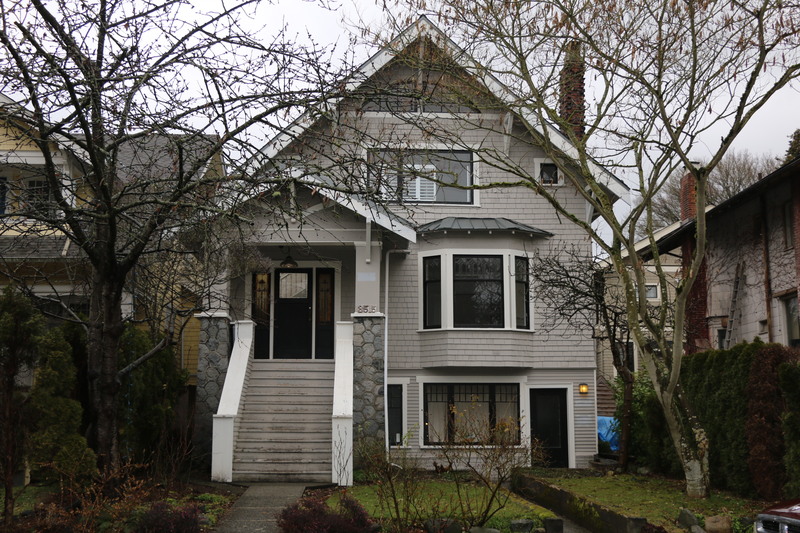 The unintended consequences of the property-tax surcharge hasn’t been thought through. They have already had to exempt multi-family rentals of four units and more after pushback by the rental industry. Increased taxes would have been passed onto tenants. But so to for houses divided into two or three suites, so what about them? Property taxes should be affordable to people and not punitively forcing people into debt. Taxing people out of their homes isn’t making life more affordable for British Columbians. And the provincial encroachment into the municipal tax base undermines the cities’ ability to provide the civic services that property taxes are intended for. This entry was posted in Elizabeth Murphy, Vancouver Sun and tagged Affordable Housing, Chinatown, Community Plans, Elizabeth Murphy, Heritage, Vancouver. Bookmark the permalink.